A Charcot Restraint Orthotic Walker (CROW) is a brace that encompasses the entire foot, ankle and lower leg. 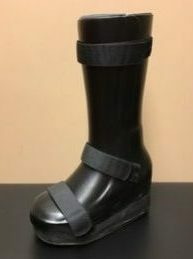 The CROW uses the gold-standard principle of total contact casting and is indicated for those who suffer from ulceration, pathological micro-fractures and/or insensate feet usually secondary to pathologies such as diabetes, peripheral vascular disease, atherosclerosis, arteriosclerosis and charcot neuropathy. It is a clam-shell design with the entire interior of the brace lined with very soft foam materials to accommodate any open wounds/sores. This design serves to immobilize, protect and re-distribute pressures while still allowing the individual to ambulate and weight-bear. This design is not recommended for those experiencing large tissue volume fluctuations. 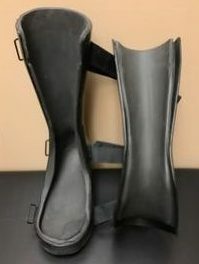 This orthosis has a rocker sole and is not worn with shoes.